Are you looking for a squirrel baffle to protect your bird feeder? If so, you're in the right place! If you want to reliably protect your bird feeders from squirrels, you’ll definitely need baffles, and we have the answers you’re looking for. Of all the baffles we examined in this review, our top pick goes to the Audubon Baffle. While there's no such thing as a perfect baffle, this 18-inch diameter metal baffle does the best job of any we've seen. It stands up to the weather, is very rustproof, and resists chewing. It's easy to install and/or adjust. Once installed there's no on-going maintenance required. Just let it work. What Is A Squirrel Baffle? How Do You Choose The Best Squirrel Baffle? Where Should Baffles Be Installed? What Types Of Squirrel Baffles Exist? How Do You Install A Squirrel Baffle? Check out our summary list below, or keep reading for a more in-depth review of squirrel baffles. The definition of a baffle is fairly simple: a device such as a plate, wall, or screen to deflect, check, or impede someone or something from reaching their goal. A maze would be an example of connected baffles (walls) impeding your progress to the exit. A line of trees acting as a windbreak are another kind of baffle. In the case of a squirrel baffle, it's usually a small plate or tube wrapped around a bird feeder pole that keeps the squirrels from getting to the bird seed. Squirrels often eat seeds, the same seed birds love to eat. Since they're eating the same type of seeds, the baffle has to be able to withstand their repeated attempts to get past it. This means it needs to be constructed from a durable material such as metal in order to last more than a few months. Otherwise, the squirrels will eventually chew through it. They're not smart, but they are persistent. Finally, the lowest part of the bird feeder should be higher than the top of the baffle. As long as all these conditions are met, most baffles will work with a high degree of reliability. But if you skimp on any of these conditions, the squirrels will just laugh at the baffles and keep on going. The number one consideration should be the material the baffle is constructed from. Squirrels have a propensity for chewing through plastic and anything that isn't metal. Since they don't hibernate they're going to be exploring and, chewing on things, all year round. This means any baffle that isn't metal is eventually going to be chewed to pieces. It may take them a while, but with hunger driving them, they'll keep at it until they succeed. If you get a plastic baffle, you have to view it as a disposable product with a relatively short lifespan. Far and away the vast majority of all squirrel baffles are installed near bird feeders. If squirrels are getting into your house or garden, there aren't any baffles available to keep them out of those areas. You'll have to use other methods. Baffles are almost always used to protect bird feeders. There are two major types of squirrel baffles, wrap around or torpedo. Wrap around baffles do exactly what the name would suggest; they wrap around the pole the bird feeder is mounted on. They can be installed after the pole and feeder are already in place. 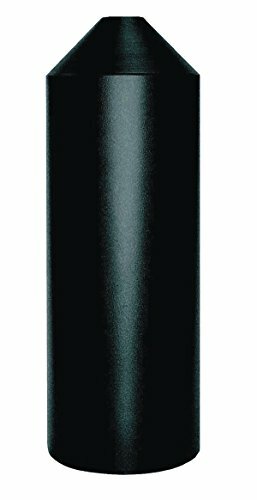 Torpedo baffles are unbroken cylinders that can only be mounted by sliding them onto a straight pole. If your bird feeder is suspended from a shepherd's hook, you'll have to pull it out of the ground to mount the torpedo. Unfortunately, most of them have an extra prong on the bottom to stabilize the pole. That extra prong will make it impossible to mount the torpedo on the pole. The first thing to understand is that squirrels are incredible jumpers. Many of them can jump 5-feet straight up! Therefore the bottom of the baffle (wrap around or torpedo) must be higher than that. Otherwise, they'll be able to jump up and catch the edge of it, then pull themselves up. The ground around the bird feeder must be level, with nothing, absolutely nothing, above ground level for at least a 12-foot radius around it. Squirrels can leap 10-12 feet horizontally, and even further if they're jumping from a higher position to a lower one. There must not be any overhanging objects – trees, fences, houses, lattices, etc. – within a 20-foot radius in all directions. Squirrels can jump tremendous distances from tall objects, sometimes almost seeming to glide part of the way. They can also drop a long way straight down without injuring themselves. As a recap, here the 5 squirrel baffles we looked at. Our #1 pick went to the 18-inch Audubon Wrap Around Baffle, but don't forget to check out the others to see if one of them better suits your needs. Specifically, take a look at the Audubon Torpedo Baffle. Squirrels that can get past one type of baffle are often stopped by a different one. 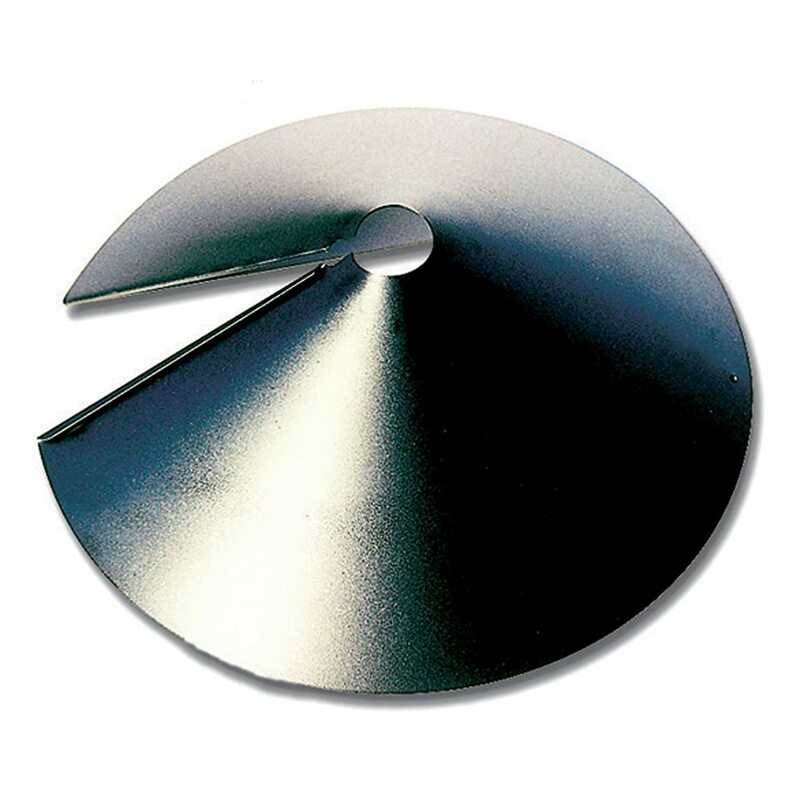 This baffles is constructed from textured powder-coated steel and is 18-inches in diameter. An included coupler that looks like a four-pointed star, clamps to the bird feeder pole to hold the baffle in place beneath the bird feeder. The coupler will attach to any pole that is 1/2-inch to 1-3/8-inch in diameter. The baffle is shaped like a cone, sloping down from the top like a volcano. When squirrels climb the pole and get to the baffle, they can't find any way to get past it. Because it's made of steel, they can't chew through it either. And the powder coat keeps it from rusting. However, if your squirrels are big enough to reach the edges of the baffle, they'll be able to grasp it enough to pull themselves up and over it. Another thing to be aware of is that the coupler is fairly weak. Try replacing it with something a bit stronger for better results. 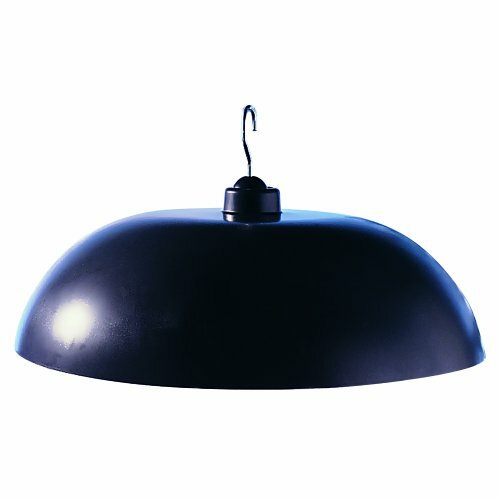 Shaped like the torpedo in its name, this baffle is constructed out of textured powder-coated steel. It includes a black, star-shaped coupler which can be mounted on any 1/2-inch to 1-3/8-inch pole. This is a “slide-on” baffle which means you have to slide it onto the pole before planting the bottom of the pole in the ground. The baffle is 6-inches in diameter, enough for squirrels to get up inside it, but no further. This baffle rotates on the coupler/clamp underneath. When they try to grab the bottom of the torpedo, it rotates and they skitter away. The included coupler seems a be weak though, and you may want to consider replacing it with something stronger that will hold the torpedo in place but still let it rotate. This only works on straight poles and the baffle needs to be high enough off the ground that the squirrels can't jump on top of it. Four to five feet seems to be optimal. Once again though, large squirrels have been able to defeat this baffle. This 16-inch clear baffle is placed above the bird feeder, where it also serves as a weather shield for the birds. The transparent plastic doesn't obstruct your view of the birds. It can also be placed below the feeder to act as a more traditional baffle. 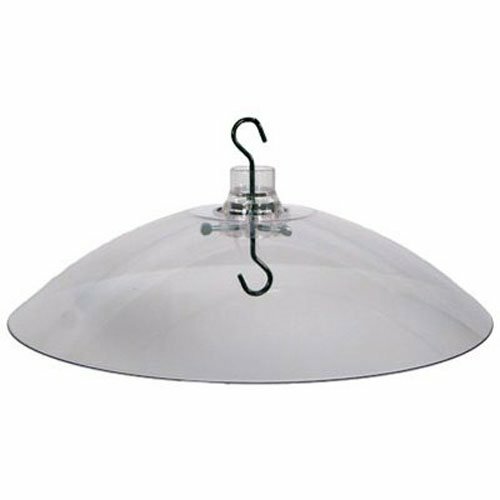 Like the first two baffles, this one will fit on a 1/2-inch to 1-3/8-inch pole and includes a clear plastic coupler that will hold it up when you're mounting it under the bird feeder. Otherwise, there are hanging hooks and instructions for mounting it above the feeder. This baffle is made of plastic which is fairly brittle. If the squirrels knock it over it'll crack at the very least, and possibly break. It does a reasonable job of keeping out most squirrels, but nimble or large squirrels can get past it. When hanging them above the bird feeder, one possible option is to mount two of them, six to eight-inches apart above the feeder. The swing and sway from one to another will double the difficulty for the little critters of getting past them. This is identical to our top pick in every respect except that it is only 14-inches in diameter instead of 18-inches. It's constructed from powder-coated steel, mounts on any 1/2-inch to 1-3/8-inch pole with a star-shaped coupler, and wraps around existing poles so you don't have to dig them up to mount it. The smaller diameter is a concern though. If you're only dealing with chipmunks it would probably do the job, but most squirrels are large enough that they'd be able to get past it with very few problems. Because it's smaller, it's also less expensive, but if you've got squirrels you need to spend the extra cash to get the full-size baffle of the top pick. 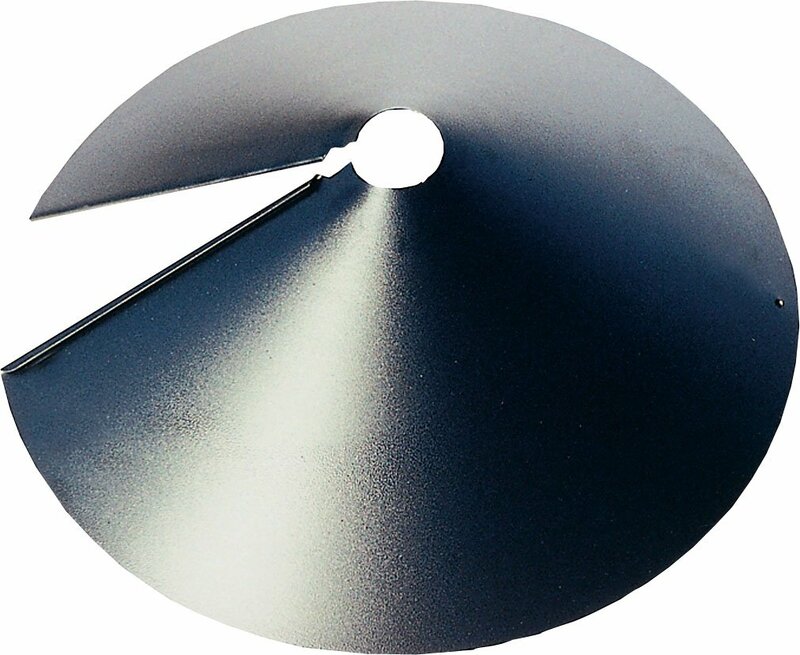 This baffle has all the same pros and cons as the top pick, in addition to being smaller. This 15-3/4-inch wide dome is nicely designed to keep out normal squirrels and chipmunks. It hangs over the feeder and tilts when the squirrels put their weight on it. There's nothing for them to hang on to and they fall to the ground. Unfortunately, it doesn't work quite as well for larger squirrels. They can grab the hook assembly with their back feet then hang down to reach the bird feeder. Attaching 6-8 inches of chain between the dome and the feeder makes it harder for them, but occasionally an enterprising one will figure out how to grab the chain and scurry down that. This only fits on a pole diameter from 0.5-inches to 1.25-inches if you're using it below the bird feeder. The black plastic dome is thick and fairly resistant to their efforts to chew on it, but if it ever drops onto concrete or rocks, it will shatter. Squirrel baffles come in many different shapes and sizes. In doing our research we were surprised to discover just how many different shapes and sizes there are. But overall, our pick goes to the Audubon Wrap Around Baffle. It has a decent track record of success and has a long, useful lifespan. It does a respectable job of keeping squirrels away from bird feeders, so you can enjoy your bird watching. A close second though is the Audubon Torpedo Baffle. If the cone-shaped wrap around baffle isn't your cup of tea, this one might be.